A super-sensitive tooth or pain and swelling at the gumline could mean dental abscess or dying tooth pulp. 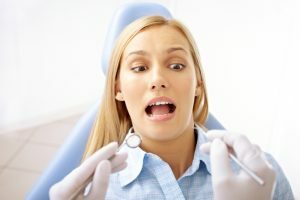 A great alternative to tooth extraction is root canal therapy. Also called endodontic therapy or simply, “ a root canal,” this restorative dental service removes diseased inner pulp and preserves hard tooth structure. Dr. J. Robert Connelly DDS, root canal dentist, expertly performs endodontic therapy to restore health and appearance to smiles in the San Marcos area. The objective of root canal therapy is to remove the infected or injured inner pulp and crown the tooth to strengthen and preserve it. An adult tooth functions well without the nerves, connective tissue and blood supply in its inner chambers, or root canals. Critical tooth structure, such as the periodontal ligament which anchors roots to bone and surrounding soft tissue, remains intact and functioning. Dr. Donnelly ensures the patient’s complete comfort during the one- to 2-visit procedure by using local anesthesia (pain shot) or oral sedation, if the patient desires. He begins the treatment by placing a protection rubber dam around the tooth, and he drills a small pilot hole into the first of up to 4 root canals in the tooth. 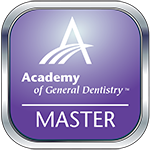 To remove the pulp and debride the root canal, the San Marcos dentist uses several small files of increasing size. When each root canal is clean and smooth, he instills anti-microbial medication to treat the infection, and he fills the inner chambers with gutta-percha, a natural, rubber-like sealant. A temporary filling completes the day’s procedure. After a week or so of healing, the patient returns to San Marcos Gentle Dental for placement of a customized porcelain crown. The crown supports, protects and beautifies the tooth, preserving it for years. Aftercare of a tooth treated with endodontic therapy includes routine brushing and flossing twice a day at home, and of course, 6-month check-ups and cleanings with Dr. J. Robert Donnelly and his dedicated team. Root canal therapy at San Marcos Gentle Dental saves and preserves a failing tooth. Keeping your natural teeth in place as long as possible allows for natural chewing, speech and facial appearance. Additionally, gum tissue and jawbone remain intact, avoiding recession common to tooth loss. If you are concerned about the health of a tooth, don’t fear root canal therapy. 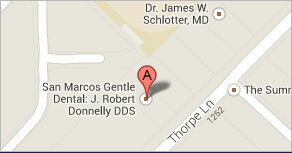 Instead, contact San Marcos Gentle Dental for a consultation with expert root canal dentist, Dr. J. Robert Donnelly.